Have you ever gotten so excited about something that you just couldn't wait to share it, even though it wasn't nearly ready? That's how I'm feeling about my October Pincushion for the CQJP 2014! So here is a sneak peak at it! Really though... I feel like I've had a breakthrough this past couple of weeks. Suddenly things are coming together in a way I haven't experienced in a long time. Creativity flows and the ideas spring up like new planted seeds in the springtime. I just can't stitch fast enough to make it all happen! Maybe it's been due to having enough time at home, due to having been sick, that allowed me to just sit in my studio day after day and work unhindered for the first time in a long time. Regardless, I'm really excited about where my art is headed! 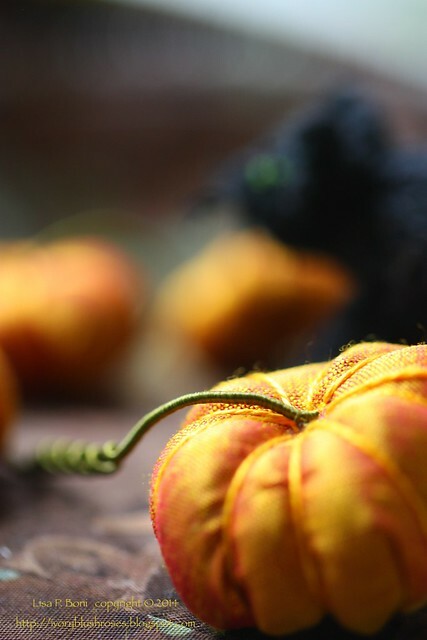 I stitch all day long from nearly the moment I rise in the morning until it gets too dark to stitch comfortably. Then as the night falls, I find myself gravitating towards the computer. Not to aimlessly browse eye candy on Pinterest (though I do my share of that too at times ~ it can be so inspiring! ), but rather to work on other projects. I'm nearly caught up with getting my blog put into Blurb books. But the big project, long in the works, has been compiling a Family Cookbook. That project has been keeping me up late at night as I work into the dark hours until at last I look at the clock, gasp at the time and head for bed. 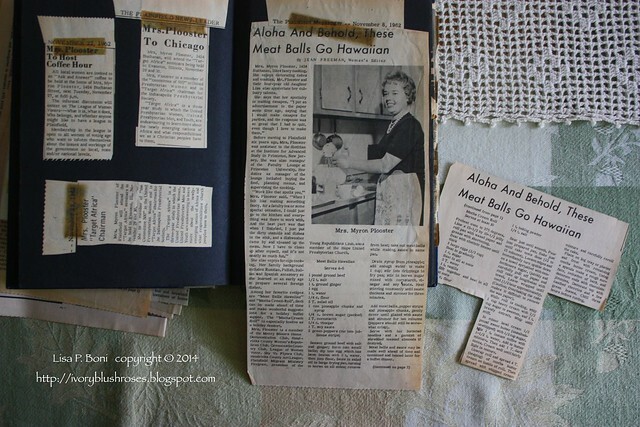 My Mom was an inveterate collector of recipes. And a terrific cook. She could whip a glorious meal up out of seemingly nothing in the kitchen. If she ate something that a friend made, she'd ask for the recipe and then proceed to make it her own. 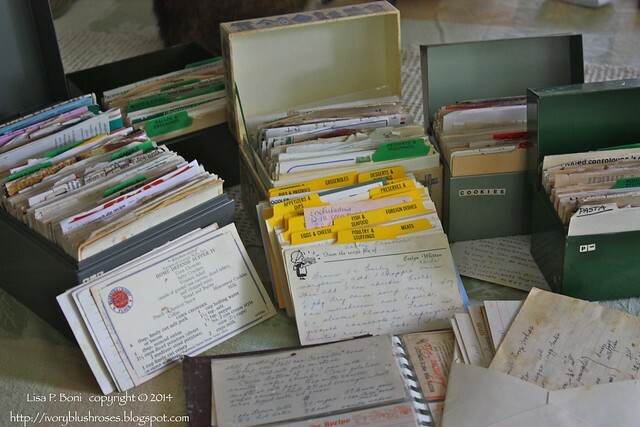 As the family historian, she also collected recipes from family members and added them to her collection. Which means that trying to organize all these recipes and choose which ones should go into a family cookbook is quite the job. But I'm finally nearing completion as all the organization is completed at last and the vast majority of the desired recipes have been put into the computer! Not only are there boxes and boxes of recipes, but my Mother's scrapbooks to go through. 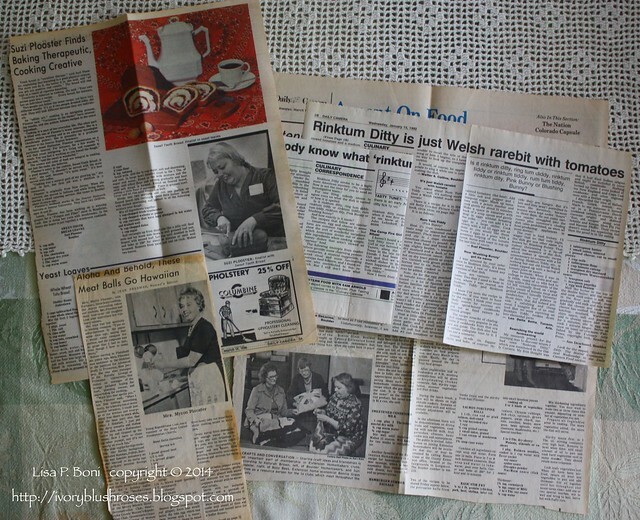 She had a knack for getting featured in the local newspaper for many different activities, including these four articles that featured her cooking and/or recipes. The article with the red photo background was from a contest that she entered. Out of over 15,000 entrants, she was one of 18 finalists and took 2nd place in the category of yeast breads! My mother was always involved in a huge number of things and this two page spread out of one of her scrapbooks is a good indication of that. In 1962, she started up the League of Women Voters in the community we were living in at the time. She also was very active with the Presbyterian Women's group in the area and ended up as "Chairman" for a project called "Target Africa". And she was featured as an up and coming hostess in the women's section of the paper. She catered many luncheons in the area and I particularly remember her making many times, a beautiful luncheon loaf with layers of bread and ham, chicken and tuna salad on the inside and decorated outside with cream cheese frosting artfully applied in the form of spring flowers. Unfortunately, that is one recipe I don't seem to be able to find, nor have I found a single photo of one of these creations. The main article here talks about how she used to make canapes for people until she had so many orders for them that she had to stop! So, while home sick, I've managed to stay busy, stitching by daylight, working on the family cookbook by night. At long last, I'm finally feeling better and look forward to heading back to work this coming week. But I sure will miss my stitching and cookbook writing time! I love that little glimpse of your latest pincushion! And doing the recipe book is obviously a labour of love, but one full of memories. Glad you are feeling better Lisa. You had a good rest, and created while healing, that's a good thing. Your latest pincushion is going to be adorable I can tell. Your family cookbook is going to be wonderful too. Now I'm anxious to see the rest of the pin cushion. They are always so beautiful. I have been going through my mother's recipes also Lisa, so many. I love the ones that are hand written, and those of loved ones passed that are in their own hand writing. It makes it even more special doesn't it?